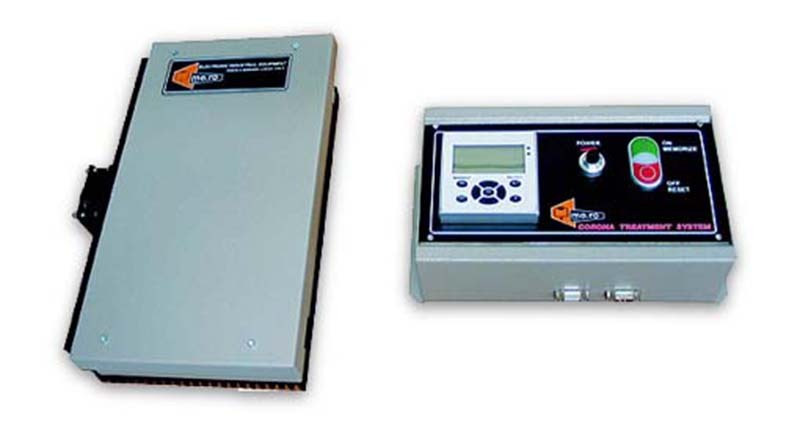 The new generation corona discharge generators represent the new industrial standard for this type of device. The -MOSFET- modules installed in them, featuring high switching speed with low losses, combined with the configuration of the power circuits, ensure high performance and complete self-protection in the event of accidental overloads. The generator can be mounted outside or inside an electrical cabinet. High efficiency thanks to the configuration of the power circuits and the use of -MOSFET- modules. Single-phase supply voltage 220/240V (without need for a network transformer). Fieldbus connection to production process ASI/PROFIBUS/CAM OPEN/DEVICE NET.